Make a remarkable entry for your garden or home using this New England Fairfield Grande Arbor with Trim. 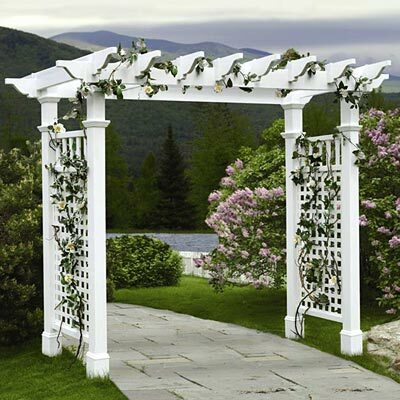 This generous, pergola-style arbor lends a touch of the eastern seaboard to your garden, thanks to its crisp white color, square lattice, and flat top. The four, upright posts create a stable base for this unit, and its significant size spans a large walkway or forms a dramatic entry. Horizontal slats along the flat top enhance the geometric motif, and a square lattice on each side panel completes the look. Flared base moldings and extra trim caps on each leg further the elegant style, and the vinyl construction ensures a durable and lovely structure. Add color to this arbor by training your climbing plants to wind through the lattice as they grow, for blooms in unexpected places. Place a wooden 4 x 4 post (not included) into each leg to install it securely in soil, or use a New England Post Extension Kit (not included) for installation on uneven ground. The vinyl body will not crack, yellow, or rot, and requires little maintenance, while the item's white color will remain bright for several seasons. Create an impressive and lasting entry into your backyard with this Fairfield Grande Arbor with Trim. Assembly required. Twenty year warranty.